Login with your username or email address. The Londonderry Fire Company has teamed up with WHTM 27 News and the Kidde Fire Systems to make sure that there are smoke detectors in every home. Through this program, WHTM 27 News has provided smoke detectors to our company for us to install in homes, free of charge. If you are in need of smoke detectors, please contact the Fire Cheif at 717-944-2175 and leave a message to set up a time for us to come out and install these free smoke detectors. 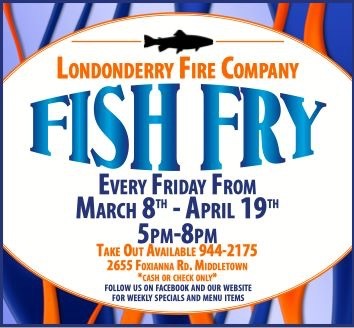 Join us every Friday from March 8th to April 19th for our annual Lenten Fish Fry! Full menu also available for take out by calling 717-944-2175. *Weekly specials are subject to change. Follow our FaceBook page for updates. Join us Saturday April 28th for our first chicken BBQ of the year! Meals are available from 10am to 2pm for pick up or delivery. For delivery call 717-944-2175. Price is $10 and meal includes 1/2 chicken, baked potato, applesauce and dinner roll. FREE Admission, FREE Parking! Sunset Park opens to the public at 5pm - No early admission. 7:00pm - Sunset Bar & Grill The Whiskey Brothers Band, a Southern Rock band who have performed with original members of Lynyrd Skynyrd, .38 Special, Blackfoot & the Allman Brothers! Bring chairs and friends! Beer, Wine and Mixed Drinks on the deck and Williams Food Trucks! A great location for the 9:30 - 10pm fireworks spectacular! 8:00pm - Sunset Park The New Holland Band, a concert band performance playing a variety of music, including patriotic songs. Bring blankets and chairs to sit on (No tents or grills, please). There are playgrounds for the kids and Williams Food Trucks will be in the park selling a large variety of food and drinks! 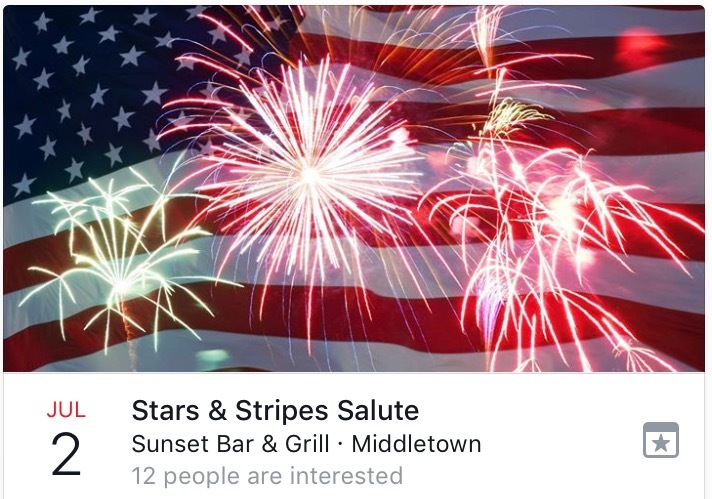 This is a great location for families to hang out and to see the fireworks from the ground up from 9:30pm - 10pm! Sunset Park opens to the public at 5pm - No early admission. Crash at Vine St. and Red Bridge Rd. Engine 54, Engine 54-1, Utility 54, Duty Vehicle and Middletown Rescue 88 responded to this crash with confinement on Vine Street at Red Bridge Road. Crews had to remove the drivers door to access the patient. Two people were transported to the hospital. All crews worked well together! Copyright © 2006 - 2014 Londonderry Fire Company. All Rights Reserved. Website hosted and maintained by Cloud 5 Solutions, LLC.